Salted and caramel, 2 words that make us drool a little! This paleo salted caramel smoothie is seriously good. It’s a bit of a treat or the perfect post work out meal! Smoothies are also the PERFECT brekkies on the go. This salted caramel goodness is totally delicious and super quick to whip up! 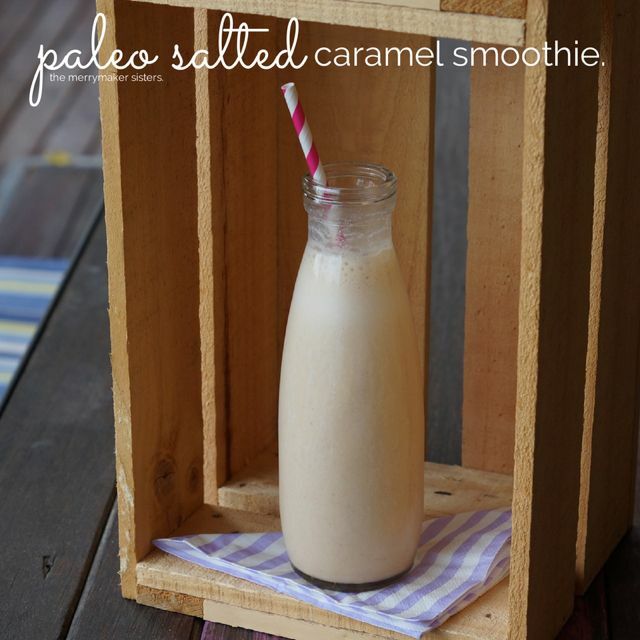 Don’t forget to share your paleo salted caramel smoothie goodness on social media! Find us over on Instagram here and Facebook here! Use #themerrymakersisters so we don’t miss a pic! p.s you can make your own almond milk! p.p.s find this recipe, actually over 300 recipes on the Get Merry recipe app. Download it HERE! Simply place all of the ingredients in to your blender (we use our Vitamix) and WHIZ. GULP. BANG!